JewDub Talks is now in its third year of offering an academic Jewish twist on the popular TED Talks format. 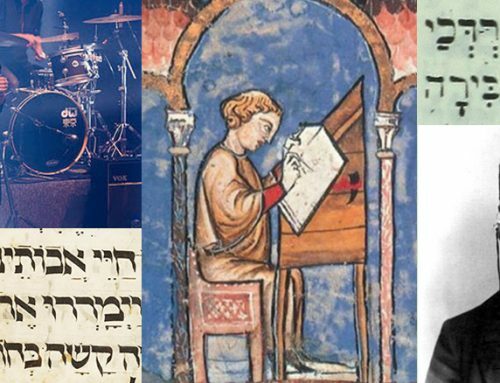 On January 29th, 2015, four outstanding speakers offered pocket-sized lectures on Jewish history, religion, and the arts. 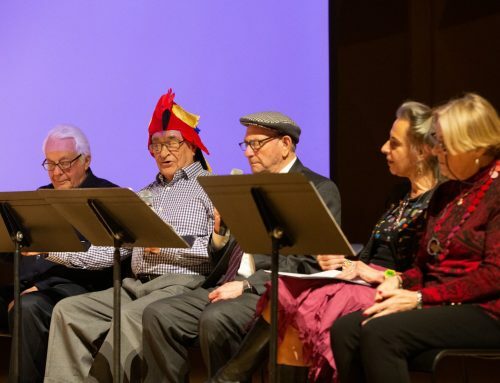 A dominant theme connecting the talks was the changing shape of the Jewish community, which prompted each speaker to consider questions of boundaries and who is an “insider” and an “outsider” in contemporary Jewish life. 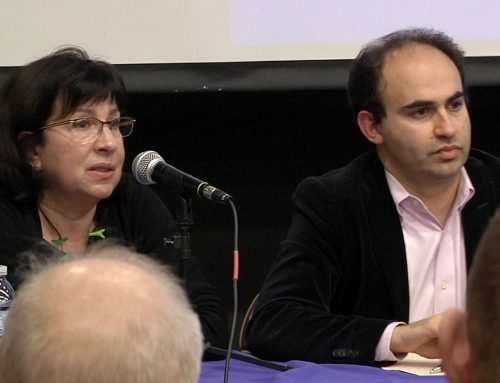 To sample talks from previous years, like Barbara Henry’s “So Why Yiddish?” (now with over 16,000 views! ), you can visit the Stroum Center’s YouTube channel. Here are the videos from JewDub Talks 2015. Take a look and share the ones you like! In 1969, artist Mierle Laderman Ukeles wrote Manifesto for Maintenance Art, a rallying cry for a new way of seeing maintenance work, of seeing art, and our role in each. 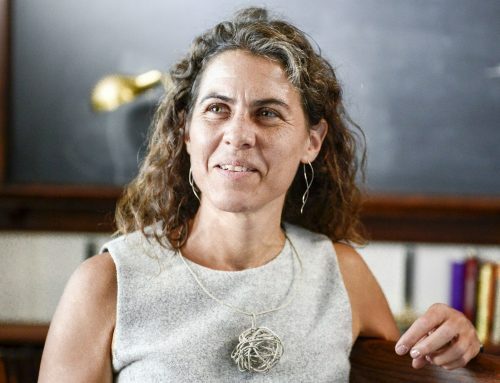 Created in a context of burgeoning feminism, environmentalism and labor activism, Ukeles’ work is also deeply rooted in a Jewish consciousness and offers a probing case study for the power of art in the world, and in the Jewish Studies classroom. Speaker Bio: Tamar Benzikry is a Seattle-based arts advocate, curator and administrator for 4Culture. She manages public art projects that bring artists’ ideas to infrastructure, collaboratively transforming utilities, buildings, buses and trails into cultural experiences. Tamar also works with museums, galleries, and educational groups to bring Jewish art to the fore. Tamar received her MA in Jewish Art & Visual Culture from the Jewish Theological Seminary in New York and her BA in Art History with a minor in Jewish Studies from the University of Washington. 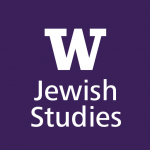 She will be teaching a seminar on “Graphic Novels and Jewish Memory” at the UW in Spring 2015. Why – and how – did German exiles succeed in shaping the Cold War in the United States? This talk looks at the career of Hans Speier, a leading defense intellectual who fled the Nazis and helped found the RAND Corporation. 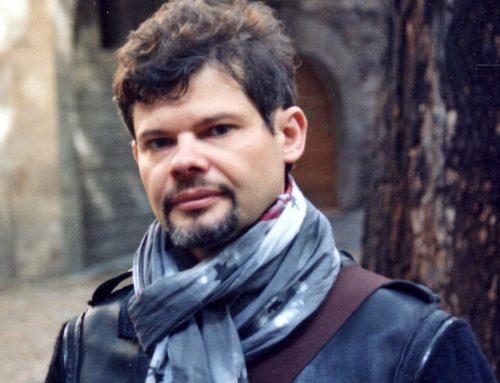 While himself not Jewish, Speier represents the worldview of a whole cohort of German-Jewish intellectuals, raising important questions about the boundaries of Jewish history. Speaker Bio: Daniel Bessner is Assistant Professor in the Henry M. Jackson School of International Studies. 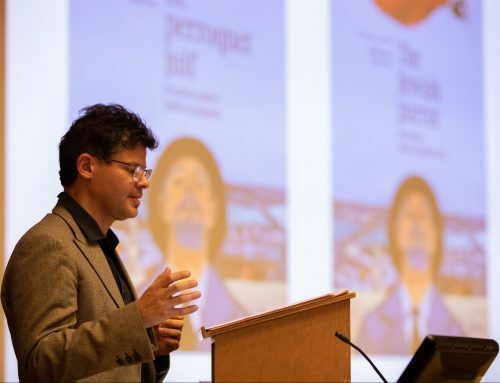 His research addresses U.S. foreign relations, cultural and intellectual history, U.S.-Europe relations, Jewish Studies, and the history of the human sciences. He received his Ph.D. from Duke University in 2013. In 2014, the International Society for Intellectual History awarded him the Charles Schmitt Prize for Best Article by a young historian. His forthcoming book, titled “Democracy in Exile: Hans Speier and the Rise of the Defense Intellectual,” is under contract with the US in the World series at Cornell University Press. Speaker Bio: Noam Pianko is the Samuel N. Stroum Chair of Jewish Studies and Associate Professor in the Jackson School of International Studies. He is the author of Zionism and the Roads Not Taken: Rawidowicz, Kaplan, Kohn (Indiana, 2010) and Jewish Peoplehood: An American Innovation (Rutgers University Press, 2015). He received his Ph.D. in Religious Studies/Judaic Studies from Yale University in 2004. Modern tools can help us research genealogy and shed new light on our biological history. Hamza Zafer’s recent discovery that he has a Jewish ancestor led him to think about ancestry as a choice. Building from his research on ancestry among ancient Jews and Muslims, he explores the question of genealogy among these two communities as immigrants to the United States. 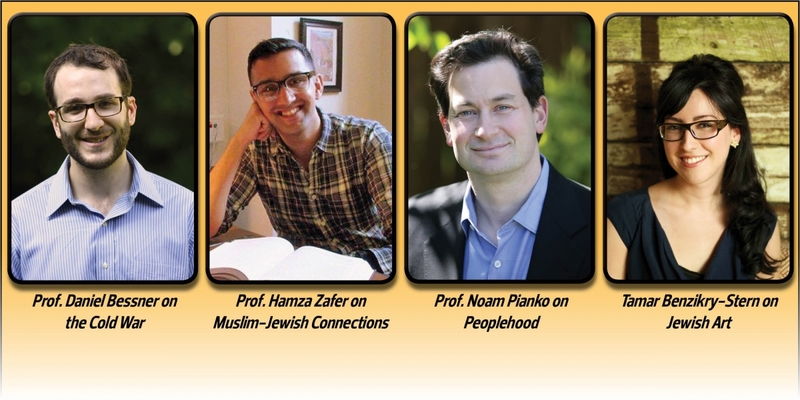 Speaker Bio: Hamza Mahmood Zafer is Assistant Professor in the Department of Near Eastern Languages and Civilization at UW. His research areas include late antique Judaism and early Islam; Jewish-Muslim encounters in the Quran and early Muslim works; and Judeo-Arabic and Judeo-Persian writings. Prof. Zafer’s forthcoming book examines the emergence and expression of communalism in early Muslim sources. It was a very interesting evening. Well interrelated thread between the selected presentations for this evening. I enjoyed it and feel enriched.